Sam Greenwood/Getty ImagesTiger Woods and Phil Mickelson are set to meet in a winner-take-all match over Thanksgiving weekend in a showdown that will likely produce one of the richest prizes in golf history. 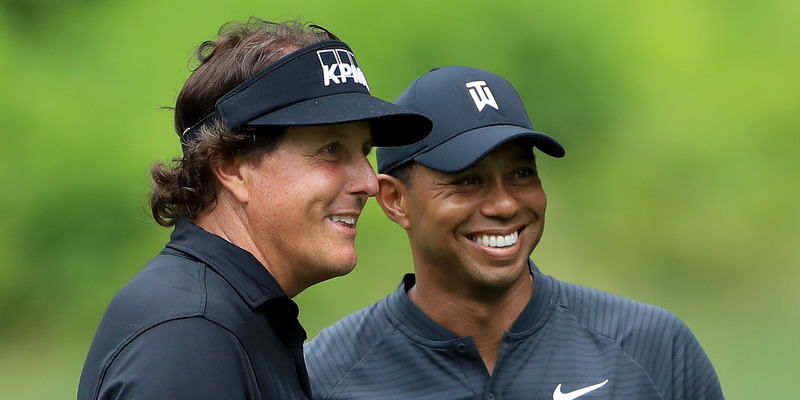 Details are starting to emerge regarding the high stakes one-on-one matchup between Tiger Woods and Phil Mickelson. ESPN’s Mike Greenberg says sources have told him that the match is set for Thanksgiving weekend at Shadow Creek Golf Course in Las Vegas. While the purse has not yet been finalised, previous reports set the winner-take-all prize at $US10 million. The rumoured one-on-one matchup between Tiger Woods and Phil Mickelson is reportedly set. ESPN’s Mike Greenberg said on Thursday morning that sources had told him the match would take place over Thanksgiving weekend at Shadow Creek Golf Course in Las Vegas on either Friday, November 23 or Saturday, November 24. While the winner’s purse still has not been finalised, previous reports on the much-anticipated match put the prize at $US10 million. The news comes just a month after Golf.com’s Alan Shipnuck reported that plans for a match between the two golf legends had fallen through after a potential date had been set in July. According to Shipnuck, the plan was for a $US10 million, 18-hole, winner-takes-all competition that included a TV network and corporate sponsors. Woods and Mickelson have been great rivals throughout their careers, with two competing since their junior golf days. While their relationship has gone through ups and downs, both players have softened a bit in recent years, and the two have been playing practice rounds together regularly this season, including this week ahead of the WGC-Bridgestone Invitational. Should the Woods-Mickelson one-on-one match be a success, it could lead to similar one-off high stakes exhibition matches between the top players in golf. In the meantime, both players will continue to play through the season, with Woods and Mickelson both competing at the WGC-Bridgestone Invitational, and in contention as potential Ryder Cup picks for later in the year.